This week the air temp really started to climb. This has seen the sea surface temp rise and with it a hive of activity has arrived. All along the sunshine coast there have been reports of bait fish and flocks of gulls feeding hard. Although the pelagic fish are not here in big numbers they are here. 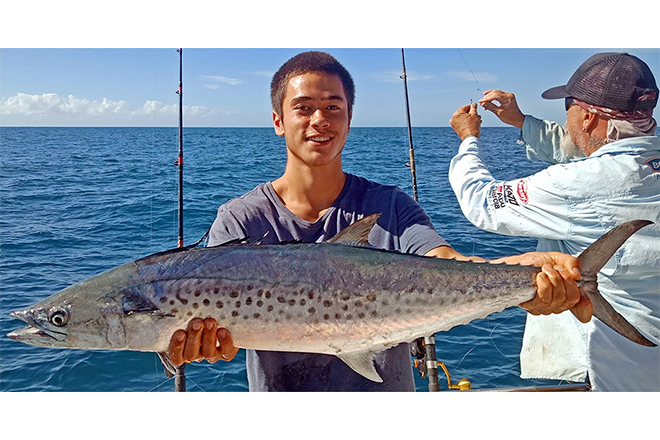 We have seen spotties sitting under bait balls along with spanish mackerel in the sub 10Kg range as well. These fish are generally holding around the 20-30m mark around the southern end of sunshine reef, castaways and down toward Coolum Reef and are taking gang hooked pilchards floated down as well as deep dropped slugs like Arma Metalik retrieved back to the surface or at full speed across the surface. Tackle to target these fish need not be heavy and 10-20lb 7ft rods, 5000 sized spin reels loaded with a quality 20lb braid is more than enough to keep it light and fun. Should a bigger fish come along then you have the power to still get the job done. Out wide the guys fishing Double Island and North Reef have been getting smaller snapper, gold spot cod, maori wrasse, big pearl perch and cobia. Standard bottom bashing gear in the 8-10kg with 40-60lb paternoster rigs and snapper sinkers. These rigs work best for all styles of reef fishing with 4/0-7/0 octopus style circle hooks covering all bases. 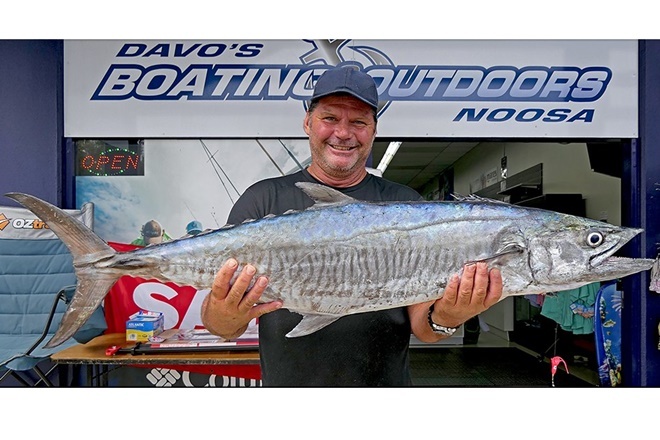 There are signs of pelagics starting to come through with a small wahoo caught at Barwon Banks on a Halco laser pro. These speedsters respond well to this style of lure and traditional skirted lures with pusher or hex/jet head on. Don’t be surprised if you pick up a dolphin fish along the way too. In closer sunshine reef has small reef fish including sweetlip, cod, pearlies and juvenile red emperor. 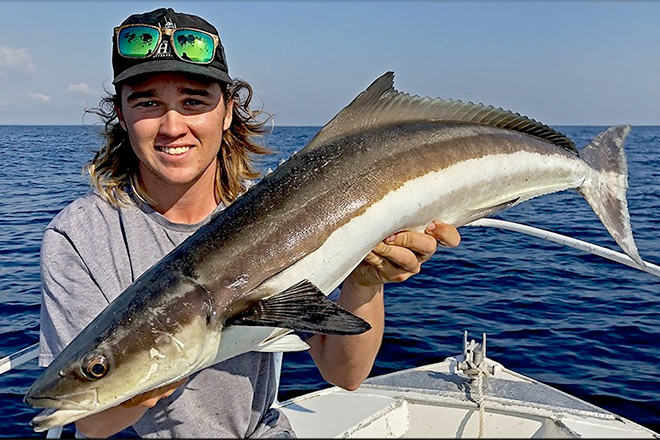 The coral trout are coming on the bite and these brutes require some serious tackle with jigging style rods the best option. These rods load up quickly and allow you to turn these fish quickly enough to stop getting bricked. Terminal tackle includes 5/0-7/0 single hooks snelled together for live baits and 4/0-5/0 gang hooks for pilchards with 50lb leaders. Along the beaches the swell has dropped off allowing anyone with even a short estuary rod a chance to have a try. Right now there are plenty of small dart and bream to be found along the beaches. In the gutters you can find smaller summer whiting and bream with deeper sections producing flathead along the drop offs. For the lure anglers have a shot at throwing small slugs and surface walkers for whiting and bream in the shallows. Noosa River is producing great jacks and some sizable flathead with trevally and tailor blowing up early mornings and late afternoons. With the hotter weather the jacks have been getting caught more frequently around the rocks of the river mouth and dog beach. If in a boat then the Noosa Sound and along the mangrove edges of the ski run and between the lakes toward Lake Cootharabah is producing good fish. The new Berkley hollow belly plastics rigged on 5/0 weedless hooks, cast deep into structure is getting some big fish. The new Chasebaits Rip Snorter weedless vibe is a great new lure designed especially for doing this is and sure to be a big hit. Trevally and tailor are taking Jackson panic prawns and risk bait surface lures off the top. Now for all the latest information log onto www.fishingnoosa.com.au for up to date bar and fishing reports, don’t forget to drop into Davo’s Tackle World, Davo’s Boating and Outdoor in Noosa and Davo’s Northshore Bait & Tackle at Marcoola for all the right equipment, bait and advice to get you catching. Be sure to follow us on Facebook and remember Tight Lines and Bent Spines!